Today's kids are techno-savvy, and many enjoy playing computer and other video games. Some educators have even found ways to incorporate the use of computer games into their curriculum in order to appeal to this generation of children. The major complaint that parents express about their children's admiration for video and computer games is the sedentary nature of such pastimes, but that has begun to change. Childhood obesity is an ever-increasing problem, and parents are right to be concerned if their children are not engaging in regular exercise. Studies show that overweight and obese children are more likely than their peers to become obese adults, increasing their risks of developing health problems including diabetes, hypertension (high blood pressure), heart disease, and some forms of cancer. Additionally, some of these conditions are beginning to manifest themselves in children, while just a few generations ago it was practically unheard of to see such illnesses before adulthood. Overweight kids may also feel a sense of social isolation, furthering their tendency to shy away from playing organised sports, but parents should do all that they can to help their children to find at least some physically challenging activities that they enjoy. Early computer and video console games didn't provide users with any physical benefits (except, perhaps, an improvement in eye-hand coordination), but some of today's most popular games are quite physical in nature. Dance Dance Revolution (DDR) gets kids (of all ages!) up on their feet to follow the dance steps on the video screen. This hugely popular game can be found in arcades and is also available for home use, making it a great gift choice for kids who love playing computer games but may need a bit of exercise. Another frequently requested game system is the activity based video game console Wii, distributed by Nintendo. 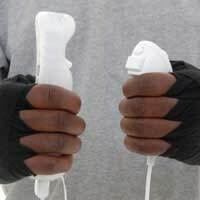 The Wii requires players to get up and move about because the movements of the hand held remotes are reflected on the screen, so kids can play virtual games of golf, tennis, soccer, or other sports, right from the comfort of their own homes. In addition, the purchase of the Wii Balance Board can help participants to achieve increasingly higher levels of fitness. Players begin by entering some basic information, such as height and weight, and are then tested to see how well they balance on both their right and left sides. The system stores profiles that includes each player's Body Mass Index (BMI), as well as a "Wii Fit Age." By regularly playing games from the available categories (Strength Training, Aerobics, Yoga and Balance Games), kids and adults can improve their overall health and fitness. Ideally, kids (and adults, too!) should engage in a variety of activities that challenge their current skill levels and increase strength, flexibility, and aerobic capacity. Fitness is a vital component to overall health, so families need to prioritise their schedules in order to include time for active play - whether by enrolling in classes, participating in organised sports, walking and biking together, or utilising activity based video and computer games. In any case, it's important that kids see their parents playing actively, too, so that they learn to view fitness as a lifelong priority, rather than simply as a part of childhood. Fitness conscious parents who play actively with their children are setting good examples and helping their kids to embark on healthier lives.